The commemorative coinage of the United States is replete with issues celebrating everything from the mundane to the monumental. 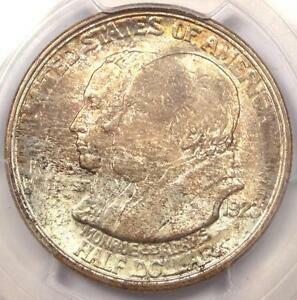 Often, many events commemorated have been relatively insignificant or of a very limited local nature, and were of little interest to anyone other than the coin-hungry collecting community, who, for a time, were eager to buy every issue offered to them. Other commemorative coins bore the banner of more nationally-important events, but frequently suffered from the avarice or neglect of their promoters. 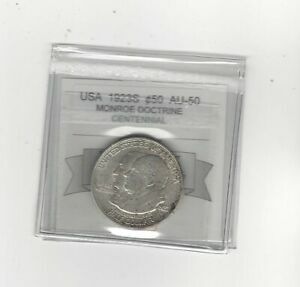 Few, however, were birthed by such convoluted reasoning as the Monroe Doctrine Centennial commemorative half dollar. Certainly, the Monroe Doctrine itself is deserving of national recognition. This foreign policy statement issued by President James Monroe in 1823 expressed in no uncertain terms that the U.S. would not tolerate European interference, control or influence in North and South America. It was a brave but empty diplomatic strategy, as America was not militarily strong enough at the time to successfully thwart the ambitions of a major European power. In fact, France and England successfully colonized the Guianas in the 1830s with no interference from America, and France even went so far as to establish a monarchy under Maximilian in Mexico in the 1860s. It was not until the turn of the century and the conclusion of the Spanish-American War that the Monroe Doctrine achieved the viability and respect necessary to be considered an effective instrument of national policy. 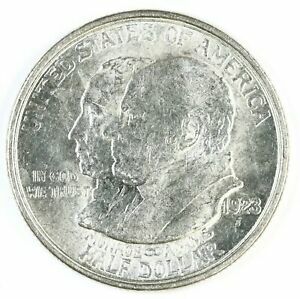 The second thread in the story of the Monroe half occurred in Hollywood in the early 1920s. Scandals were beginning to severely tarnish the reputation of the studios' stars and directors. Within only a few months director William Desmond Taylor was murdered under mysterious circumstances, Roscoe "Fatty" Arbuckle was indicted for the murder of a minor actress, and actor Wallace Reid died from a drug overdose. The studios responded by launching a public relations campaign that they hoped would help restore public confidence in the movie industry. Two committees were formed. One, the Motion Picture Producers and Distributors of America, developed over the next decade into a self-regulating censorship board. The other, the American Historical Revue and Motion Picture Historical Exposition, was a civic-minded organization whose public relations staff found it had little to promote. 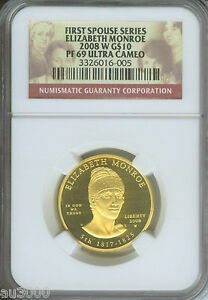 Searching for a way to raise funds, the Historical Exposition decided that a commemorative coin would do the trick, and in the process would generate much-needed goodwill for the film industry. The only problem was there were no convenient centennial or jubilee celebrations that California could legitimately claim in 1923. The most obvious historic event correlating with 1923 was the 150th anniversary of the 1773 Boston Tea Party. But in 1773, California was a largely unpopulated province in the Spanish Empire with no connection to New England. This dilemma was finally resolved by Congressman Walter Lineberger. 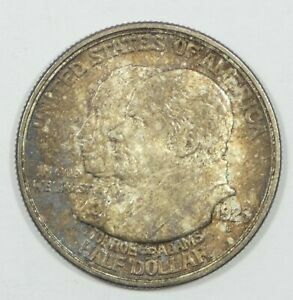 Introducing a bill to authorize the Monroe Doctrine Centennial half dollar, Lineberger reasoned that Monroe Doctrine prevented England, Spain, and Russia from claiming and occupying California. While this was nothing more than historical fiction, apparently Lineberger and his fellow representatives had little concern for such details. 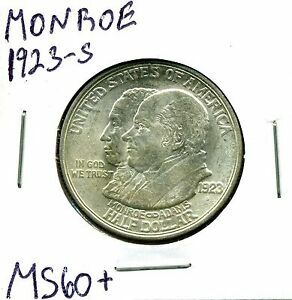 On January 24, 1923, legislation was passed authorizing the minting of no more than 300,000 Monroe Doctrine Centennial halves: the coins were to be struck at the San Francisco Mint and distributed by the studio's Historical Exposition committee. Having particular design plans in mind, the Exposition committee sought the advice of the Commission of Fine Arts as to whom might best be suited to turn their ideas into coin form. The sculptor-member of the Commission, James Earl Fraser, recommended another sculptor for the task, Chester Beach. The committee's ideas for the coin were simple enough: conjoined busts of Monroe and his Secretary of State in 1823, John Quincy Adams on the obverse, and a relief map of the North and South American continents on the reverse. Beach executed the obverse portraits as requested. The only alteration the artist made to that side was the addition of two links of chain between the words MONROE and ADAMS. 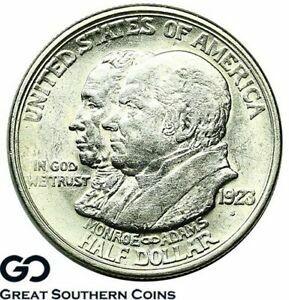 Surrounding the busts at the periphery are the inscriptions UNITED STATES OF AMERICA and HALF DOLLAR. The motto IN GOD WE TRUST is to the left and the date and S-mintmark are placed at the lower right. 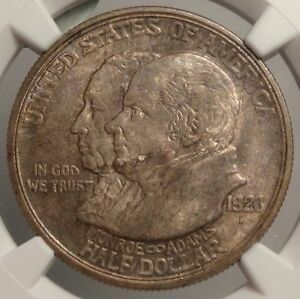 The reverse was modified considerably, and in its final form is unquestionably one of the most unusual and daring design motifs ever placed on a U.S. coin. In place of the relief maps of the continents, Beach substituted two female figures which were contorted into a rough approximation of the shape of each land mass. The North American figure holds a branch in her left hand in the area of northern Canada while extending a twig to South America through Central America with her right hand. The South American figure holds a cornucopia with her right arm. The major ocean currents of the Atlantic and Pacific are also included, and apparently represent the flow of goods between the two continents, unimpeded by the European powers. In the lower left reverse field the centennial dates 1823-1923 flank both sides of a scroll and quill, symbols clearly intended to suggest the Monroe Doctrine. Chester Beach's initials are found near the reverse rim at the four o'clock position and the inscriptions MONROE DOCTRINE CENTENNIAL and LOS ANGELES encircle the border. Struck in low relief, the design overall is uninspiring. The reverse motifs are novel and would indicate a certain creativity on the part of Beach were it not for the fact that the draped female figures shaped as two continents were actually copyrighted in 1899 by artist Ralph Beck and used by Beach for the seal of the Pan-American Exposition of 1901. 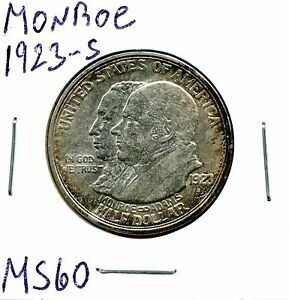 The Monroe halves were struck in May and June of 1923. While 300,000 coins were authorized by Congress, curiously only 274,077 pieces were struck (the 77 odd pieces were made for assay). A celebration commemorating the centennial was held in June in a Los Angeles football stadium. Little is known about this exposition, but it is likely that the coins, priced at $1 each, were first offered for sale there. 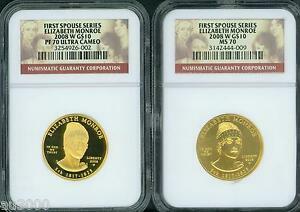 The halves were also distributed by banks and through the mail. 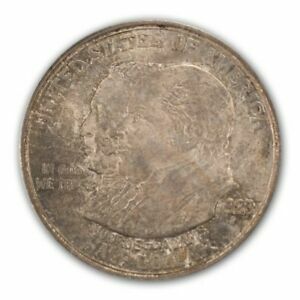 Although thousands of pieces were sold by the exposition committee, within a short time sales fell dramatically and rather than return the unsold remainder to the Mint for melting, local banks began releasing the coins into circulation at face value. 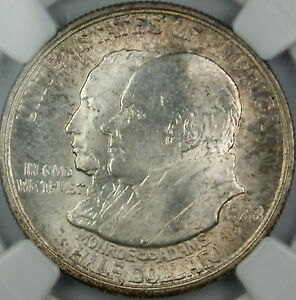 As a result, many thousands of Monroe halves exist today in lightly circulated XF-AU condition. 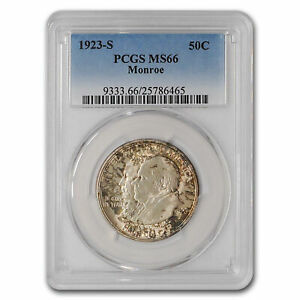 Mint-state Monroe halves are also readily available in grades up to MS-63. 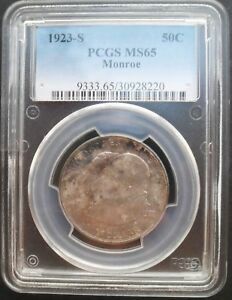 Coins in MS-64 condition are quite scarce, and full gem Monroe halves are one of the great condition rarities in the entire commemorative series. 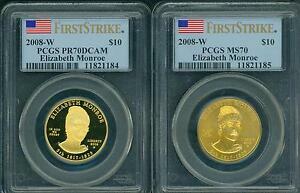 (In early 1990 a superb Monroe realized an amazing $30,800 in a major public auction). 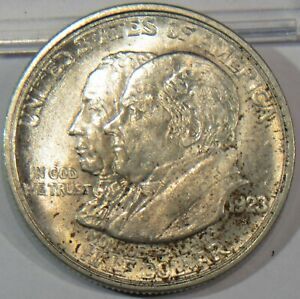 On lightly circulated specimens friction will first appear on the cheeks of the two statesmen on the obverse. The reverse will display signs of handling on the figures that represent the two continents. 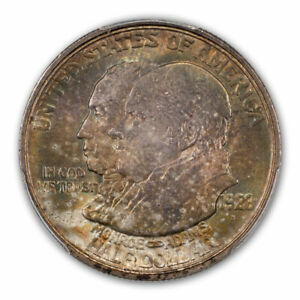 The luster on Monroe halves is frosted, but because the coins were struck in low relief their aesthetic appeal is limited. No counterfeits are known of this issue. Two matte proofs are reported to exist, but neither has been confirmed to date. The Monroe Doctrine itself took decades to evolve into one of the cornerstones of American diplomacy. 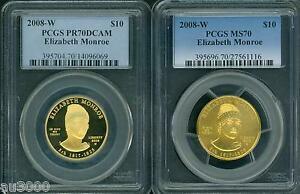 Similarly, the centennial coin struck to celebrate the doctrine was for many years an unwanted stepchild in the commemorative series. 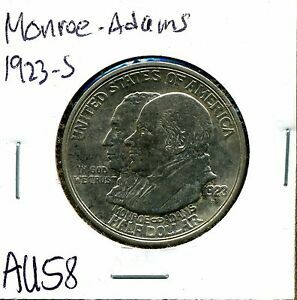 However, since 1980, and the increasing popularity of forming commemorative collections in gem condition, the conditionally challenging Monroe half dollar has earned new respect from advanced collectors of this long and interesting series.